A color explosion of fruits opens the scent including tropical mango, wild strawberry and ruby red grapefruit. Vintage floral with a rock n' roll edge brings a dark sexiness including black freesia. This contrast of floral merges into a background of hot skin musk, mandarin and mint with masculine notes of woods, incense and warm soulful amber. It is a delicious and very addictive fragrance statement. 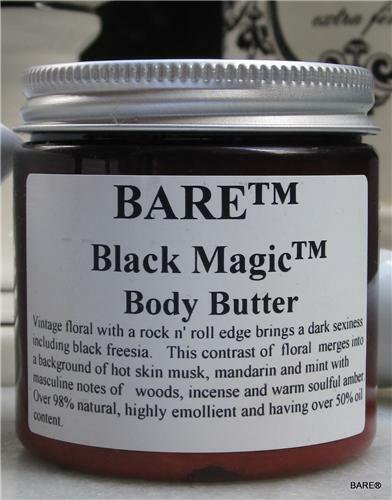 BARE "BLACK MAGIC"* Body Butter is fortified with Aloe, Shea Butter & Natural Oils. A traditional beeswax and borax body butter with origins dating back 100 Years. Over 98% natural, highly emollient and having over 50% oil content. Historically, this was called night cream or waterless cream in Eastern Europe. Thick, long lasting and capable of moisturizing the driest skin; typically being feet, elbows and knees. Associated more like a pomade or ointment than a usual cream.